JURD, James Edward -- Age 91, of Swartz Creek, went to be with the Lord and his loving wife, Dorothy on March 10, 2019. Services will be held at 3PM Sunday, March 31 at Yerian Cemetery at Brooks Road west of Durand Road, Lennon/ Durand. Arrangements provided by Sharp Funeral Homes, Miller Road Chapel, Swartz Creek. James was born on September 22, 1927 in Flint, the son of James Edward and Hope Leta (Young) Jurd. He married Dorothy Mae Hewitt in Pontiac, Michigan, on October 27, 1945. He was a proud Veteran of the military, Honorably serving in the Merchant Marines, Coast Guard and the U.S. Army. He worked at many different jobs during his lifetime, retiring from the V-8 Engine Plant in Flint in 1983 after 30 years of service. He took pride in caring for Yerian and Wilkenson Cemeteries for many years. He frequently took his grandchildren with him when he worked at the cemeteries where they were able spend precious time with him and learn his strong work ethic. 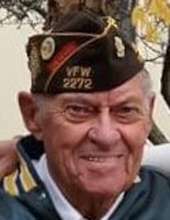 James was a member of the Am Vets, American Legion and the Durand Reed-Raymond VFW Post 2272 where he has served as a Senior Vice Commander as well as a Junior Vice Commander. He enjoyed lapidartiary, making jewelry for family and friends from a variety of stones. One of his favorite past times was basking in the sun and comparing his tan to everyone who walked in the door. He is survived by daughters, Linda (Ronald) Peake, Charlotte Jurd, Yvonne (James) Fry, Jill (Rocky) Freeman-Clements; 10 grandchildren, Jeffrey (Julie) Peake, Colleen Peake, Amy (Ken) Moll, Judy Olsen, Dawn Rogers, Carleena Mayfield, Joel (Trisha) Bryan, Christopher Bryan, Reece (Whitney) Freeman and Michael (Kassidy) Martinez; 15 great grandchildren and 4 great-great grandchildren; and, special niece, Joy Ann (Ron) Coleman. He was preceded in death by his wife, Dorothy; parents; and 3 sisters, Madaline, Doris and Joyce. Those desiring, may make contributions to Durand Reed-Raymond VFW Post 2272 or John Brown Liberty Ship. To send flowers or a remembrance gift to the family of James Edward Jurd, please visit our Tribute Store. "Email Address" would like to share the life celebration of James Edward Jurd. Click on the "link" to go to share a favorite memory or leave a condolence message for the family.